Trigger Slap is the little annoying phenomena not just unique to Romanians, but a good number of AK's in general. 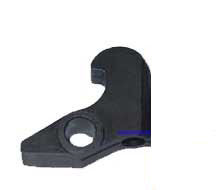 Trigger Slap is caused by out of spec Fire Control Group parts, specify it occurs when the rifle's bolt recoils hits the hammer which in turn moves down and locks under the disconnector. When the hammer moves the disconnector so It can be locked into place ready for the next shot, the back of the disconnector catches slightly on the trigger and causes it to "slap" back against your finger. 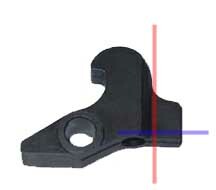 This can cause pain and discomfort when shooting. 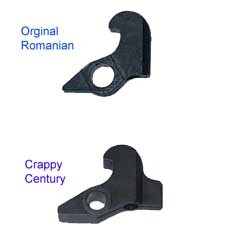 In Romanian Rifles, the fault lies with Century's poorly designed US made Fire Control Group. Instead of properly researching a nice US made Fire Control Group they copied a Full Auto design and skipped some of the last machining steps. If you notice in the photo how the Romanian group is more rounded, this is because the Romanians sent their Fire Control Group through a few more machine process. Century on the other hand, to save cost, decided that this was unnecessary and that the Fire Control Group will still be operational with out those last few crucial machining steps. What they didn't realize is that it creates a uncomfortable fire control group. So to fix slap there are two ways this can be accomplished, the first is to purchase a new properly designed US made Fire Control Group, I recommend the one from Red Star Arms (see the review in the menu to the left), or second you can fix it your self. To fix it your self you will need a Dremel and a couple of grinding stones to go with it. First completely unload, fieldstrip, and remove your rifles fire control group. If you don't know how to fieldstrip your rifle, or remove your fire control group see the corresponding tutorials on the menu to the left. Now grab your disconnector and observe the tab at the rear of it, this is unnecessary on a semi auto rifle and is part of the problem. Also take notice of the bottom of the disconnector near the disconnector spring hole. If you notice how blocky it looks compared to the original semi auto Romanian disconnector. These two areas are the cause of trigger slab so we must correct the problem. Take your Dremel and cut the area to the right of the red line off, go slowly and take your time. Make sure don't cut any thing off of the front of the disconnector, this could cause slam fires possibly killing you and or destroying your rifle. Leave the blue area alone for now. With that area cut off you are now finished. You can either (A) put every thing back together, or (B) kill two birds with one stone by going to the FCG Polishing tutorial while every thing is in pieces. If you shoot your rifle and still have trigger slap shave just a tiny bit off of the area under the blue line in the photo to the left. If your trigger slap still exist, you may have to replace the FCG with another one. I suggest getting a Red Star Adjustable Trigger becuase they are so comfortable to shoot with. BTW if you screw up your parts or hurt your self I take no responsibility.